The award-winning Wembley Stadium Tour takes you deep into the heart of the stadium to those areas usually reserved for the biggest names in sport and music. From England’s glorious World Cup victory in 1966, Bayern Munich and FC Barcelona’s stunning UEFA Champions League triumphs or the historic ongoing tradition of The FA Cup Final and the countless concerts and events that have taken place at Wembley, the all new WALK OF LEGENDS gives you the chance to relive the Stadium’s greatest moments, whilst creating some new ones of your own. Historical treasures such as the 1966 World Cup Final crossbar and the Jules Rimet Trophy are just some of the original items displayed within THE CROSSBAR EXHIBITION which unlocks the Wembley archives to showcase the Stadium’s origins, rich history and heritage dating back as far as The British Empire Exhibition of 1924. 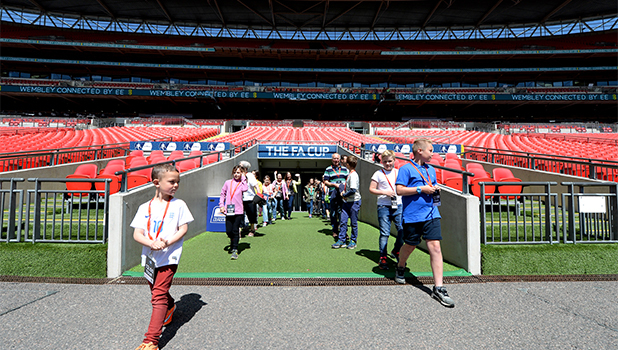 Your tour also includes access to the Dressing Rooms, Press Room, Players’ Tunnel, Pitchside and then up to the iconic Royal Box where you’ll have the opportunity to have your photograph taken with the world-famous FA Cup. Additional tours may be added at weekends and peak times.